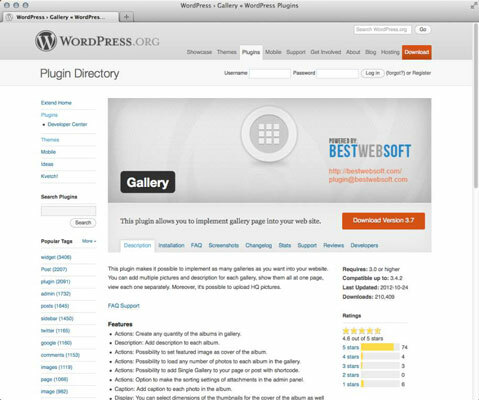 Click the Details link for a plugin to find information taken from the plugin’s page in the WordPress Plugin Directory. Make sure to check out each plugin’s Description page. Some very important information can be found on the plugin’s details that aren’t present in the results listing. When considering a plugin that you don’t have experience with, this information will help you determine how reliable and trustworthy the plugin is. Consider the plugin’s rating and the number of people that submitted a rating. The more people that rated the plugin, the more you can trust the rating; the fewer people that rated the plugin, the less you can trust the rating. A plugin that has fewer than 20 ratings is probably not very trustworthy. A plugin that has more than 100 ratings is very trustworthy. Any plugin rated between 20 and 100 times is acceptably trustworthy. If a plugin has a large percentage of one- or two-star ratings, treat the plugin very suspiciously. Take the extra step and visit the plugin’s page on the Plugin Directory to see what other people are saying about the plugin. You can do this by clicking the WordPress.org Plugin Page link on the right side of the Description page, in the FYI box. On the plugin’s page, click the View Support Forum button, or the Support link at the top of the page, to see the information posted by users, both positive and negative. You can determine whether the issues other people experienced are likely to hinder your needs. Consider is the number of downloads. The higher the number of downloads, the more likely the plugin is to work well — plugins that don’t work very well typically don’t pick up enough popularity to get many downloads. 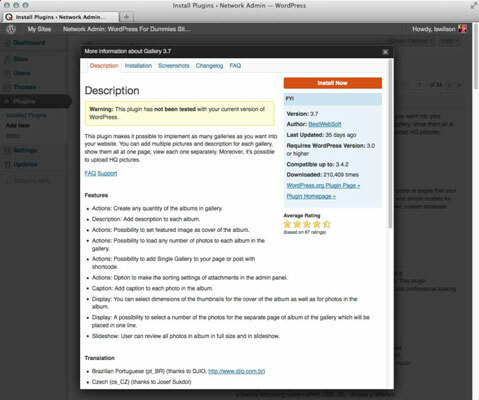 If a plugin has hundreds of thousands of downloads or more, it is extremely popular. 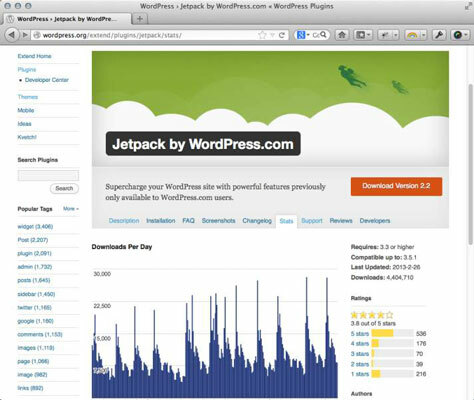 Plugins with tens of thousands of downloads are popular and may grow even more popular. If the plugin has fewer than 10,000 downloads, you can’t determine anything just by looking at the download count. A low download count should not necessarily be counted against a plugin. Some plugins simply provide a feature that has a very limited audience. Thus, the download count is an indicator but is not proof of quality or lack thereof. The number of downloads per day isn’t a foolproof method of getting a trusted plugin, but the Downloads Per Day graph may indicate that people are using the plugin with some success. 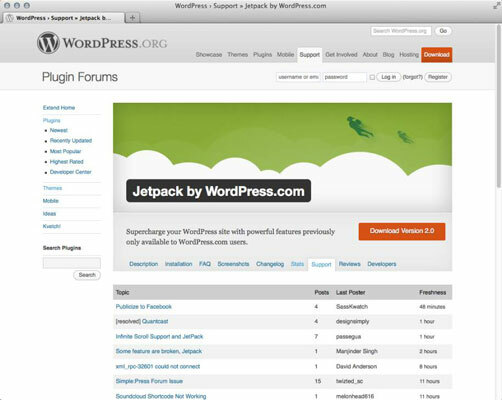 Click the Support tab below the plugin’s banner to view the support forum for that plugin. This is where users of the plugin request help and assistance. By browsing the support forum for the plugin, you can get a good feel for how responsive the plugin’s developer is to users, and you can also see what types of problems other people are having with the plugin.